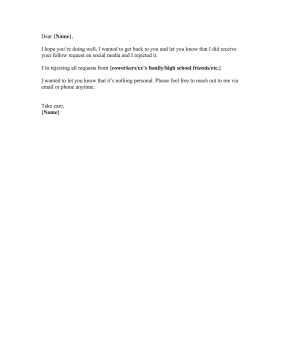 Ideal for the digital age, this printable rejection letter explains why a person did not accept a social media request. I hope you're doing well. I wanted to get back to you and let you know that I did receive your follow request on social media and I rejected it. I wanted to let you know that it's nothing personal. Please feel free to reach out to me via email or phone anytime. DISCLAIMER: The letters contained on RejectionLetters.net are suggested samples only and are not to be considered as legal advice. All content is for informational purposes, and Savetz Publishing makes no claim as to accuracy, legality or suitability. The site owner shall not be held liable for any errors, omissions or for damages of any kind. This letter template is available free for download. Formatted and ready to use with Microsoft Word, Google Docs, or any other word processor that can open the .DOC file format. If you don't see a rejection letter template or category that you want, please take a moment to let us know what you are looking for.